On Sunday, @Mreauow didn’t know what to write. So I threw out a challenge. Robin Hood with a few twists. “Marian, it would be my honor to have this dance with you.” The man held his hand out, and he stood in a half-bow, waiting for her to take his hand and accept his invitation. She caught her father’s disapproval at her lack of interest, but she didn’t care. The sheriff could wait for the rest of his life if he wanted. She didn’t desire Sheriff Knotts. Not when there was John Little Feather. She turned away from the sheriff and accepted a dance from a man she’d never met before. She learned his name, but didn’t bother to remember it beyond the dance—it only served to insult the sheriff and slight her father. But she remembered his blue and yellow cavalry uniform and the sabre on his belt. He was a fair enough dancer, but the conversation bored her. Her father’s party dragged on, and Marian wanted nothing more than escape. Escape from the pomp and circumstance, escape from the rules and acting like a lady every insufferable second of the day. After a quick glance over her shoulder, she slipped through the door and disappeared into the dark. The woods had called to her for as long as she could remember, the sounds more natural to her than those of her father’s land. Crickets and frogs in the nearby lake, the slap of fish feeding on the surface. Occasionally, something would rustle in the brush, but it usually wasn’t much. Though one time, it had been a bear. And an angry one at that. She still had the scars to prove it. For a while, she’d thought the scars had marred her supposedly unparalleled beauty. But then someone told her it proved she lived. Not that she’d survived the attack, but rather that she hadn’t allowed her father to keep her from doing the things she wanted to do. There was no glow from the full moon to guide Marian, but she didn’t need light to know her way through these woods. The darkness called to her, beckoned her into the depths of a forest few dared to enter once, let alone repeatedly. The smell of the swamps gave way to a harvest under way. She gave a sharp whistle to announce her arrival outside the small town of outlaws and outcasts hidden within the forest. She was home, and the man who held her attention would reveal himself in a moments’ time. A hand grabbed her from behind and pulled her snug against a solid body. His greeting varied from meeting to meeting, but it was never any less thrilling than the last. Marian smiled and tilted her head as John’s mouth descended on the soft flesh. The stubble at his chin scraped her skin. He pulled her tight against him. Adrenaline coursed through her. There would be a jailbreak in the darkness of the new moon. And she had the plans in her head. “What are we hitting tonight, Robin?” John asked. “We’re breaking Will out,” Marian replied. She loved it when John called her Robin. The respect he gave her, and enforced from the others in town was enough to put her in charge of the bandits. 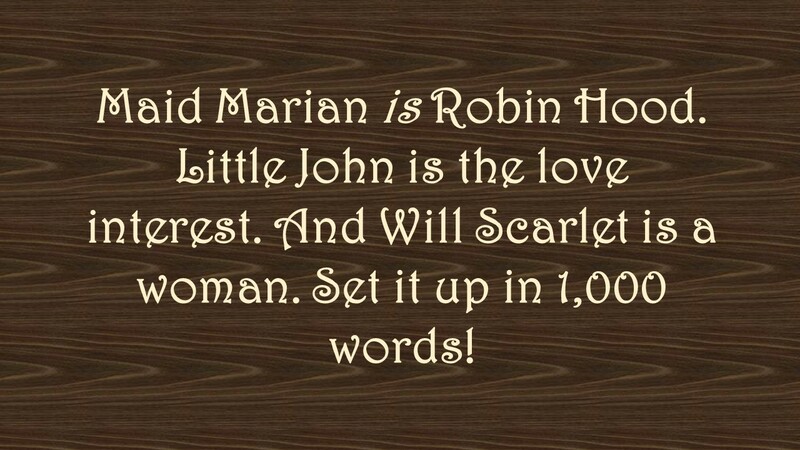 Marian caught the concern in his voice for the youngest of the Little Feather brothers. He brought his mouth down on Marian’s, and she sighed into the kiss, losing herself in the sensations of the man’s arms around her, and the way his lips fit against hers. She opened her mouth to him, and their tongues slid against each other, thrusting, stoking the fire only John had managed to light within her. Oh, her father would kill John and everyone in the town if he knew she’d so much as looked at John Little Feather, let alone let him get his hands on her. But he’d made her feel so much more alive than Sheriff Knotts could even dream, he knew her in ways no other man ever could. He understood her spirit. The black horse shifted beneath them, reminding them they had a task to complete before the night was over. And it didn’t involve the actions that went with her immoral desires. But Will Scarlet was in jail, and it wasn’t going to end well for the brunette if they didn’t break her out before sunrise. John guided the horse the rest of the way through the black forest to town, giving a sharp whistle as they approached. Another high-pitched whistle answered. Ten-year-old Shane MacDowell emerged from the darkness and helped Marian, then took the horse’s bridle while John hopped down. “Keep him near,” Marian requested. “Yes, miss.” Shane nodded as Marian and John turned to the town hall and pushed through the door. Marian took a few minutes to greet everyone before she began with her plans for the night. “Tonight, we get Will back,” she said. “Where are they holding my wife?” Blake Scarlet demanded. “That’s Sheriff Knotts,” someone grumbled from the back of the room. “How do we get around him?” Blake asked. “Will you join us tonight in celebration?” John’s black eyes were intent on her as he waited for her answer. “And the rest of the plan?” Lucas asked.